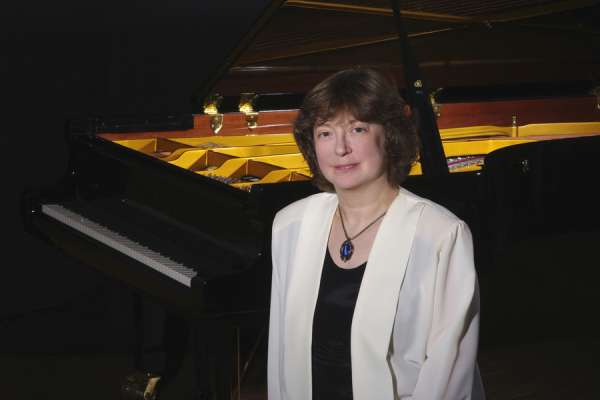 Anna Malikova was born in Tashkent, Uzbekistan, where she received her first piano lessons with Tamara Popovich. She studied in Moscow with Lev Naumov at the Central Music School and at the Tchaikovsky Conservatory, from where she graduated in 1991. Afterwards she held herself a teaching position at the Conservatory for several years. Accordingly her career started in the former Soviet Union: she gave solo recitals in cities like Moscow, St Petersburg, Omsk, Baku, to name only a few, and had appearances with orchestras like in Ekaterinburg, Minsk, Nizhny Novgorod, Kazan and Tashkent. Being a prize-winner of the important international competitions in Oslo, Warsaw (Chopin Competiton) and Sydney, Anna Malikova began to perform more and more in the West. For instance was she invited to play with the Australian Chamber Orchestra, the Sydney Symphony Orchestra, the Warsaw National Philharmony, the Academy of St Martin in the Fields and the Bavarian Broadcasting Corporation Orchestra - to name only a few. In 1993 Anna Malikova won 1st Prize at the ARD Competition Munich - the only first prize for a pianist within a period of 12 years. This success established Anna Malikova in the international music scene. Today she gives solo-recitals, performs as chamber music partner and is soloist with orchestras all over Europe, South America, the Middle and the Far East. Meanwhile she is herself invited to sit in juries of international piano competitions, like the Chopin-Competitions in Moscow and Beijing, the Vianna da Motta in Lisbon, the Gyeongnam Competition in Korea, the European Piano Competition in France, the Int'l Chopin Competition in Warsaw. Besides her busy concert schedule Anna Malikova continuously increases her recorded repertoire. Until today most of the important works by Chopin as well as works by Schubert, Liszt, Shostakovich, Prokofiev and Soler have been produced on CD. As important new recording, the five piano concertos by Camille Saint-Saëns have been released; Anna Malikova is accompanied by the Radio Symphony Orchestra Cologne under the baton of Thomas Sanderling. This production received unusual international attention and consequently it has in 2006 been rewarded with the coveted Classical Internet Award, which sums up countless international and enthousiastic reviews. 2010 a CD featuring piano works by Tchaikovsky was released, followed by the 2nd concerto by Brahms with the Duisburg Philharmonic Orchestra under the baton of Jonathan Darlington. To commemorate the 100th anniversary of Scriabin’s death in 2015, she released a new integral recording of the composers 10 piano sonatas. To Anna Malikova's projects in the future belong repeated tours through Europe and to Korea, Japan, China, South America. She will be active as soloist with orchestras, in recitals and as jury member of international piano competitions in China, Italy, Japan, Panama, Poland.